Up early after a fitful night of sleep. Something about the burn zone made me nervous. We started hiking around 6:30 through the moonscape. About 20 minutes in Elaine says she has blisters and her shoes feel like vices. The heat from Day 1 expanded her feet to the point where the toe box in the Raptors was too small. Elaine does not have a history of blistering – this was troubling. Did a little foot maintenance, but because neither of us has a history of blistering, our kit is small. Continued on through the burn for an hour plus until we hit the road that headed to Buffalo Creek. Elaine was doing OK at this point. We caught a guy – early 30's, from San Francisco, nicknamed "Just Been." 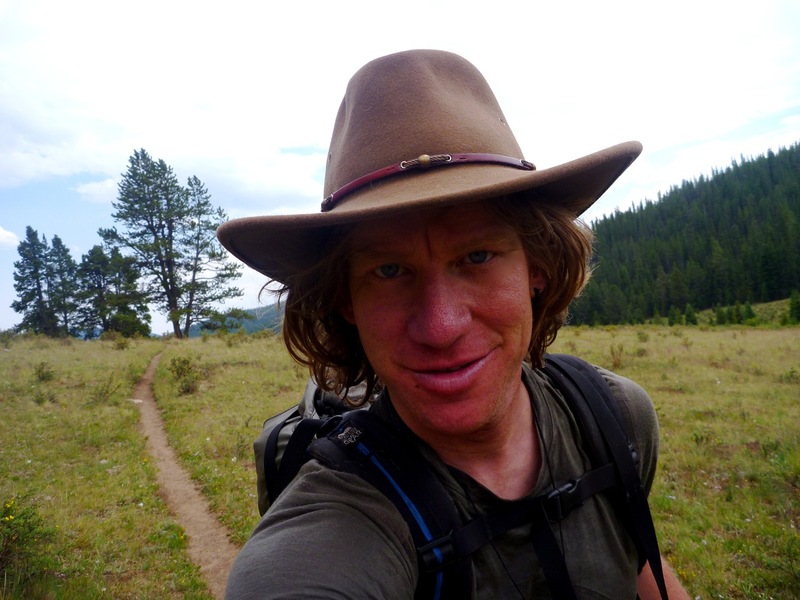 He'd hiked both the Pacific Crest Trail and the Appalachian Trail (in segments). He looked like an unassuming chap. He told us he was trying to get to Silveron in 30 or so days and that the point of his journey was not the destination but the trail. Good philosophy. 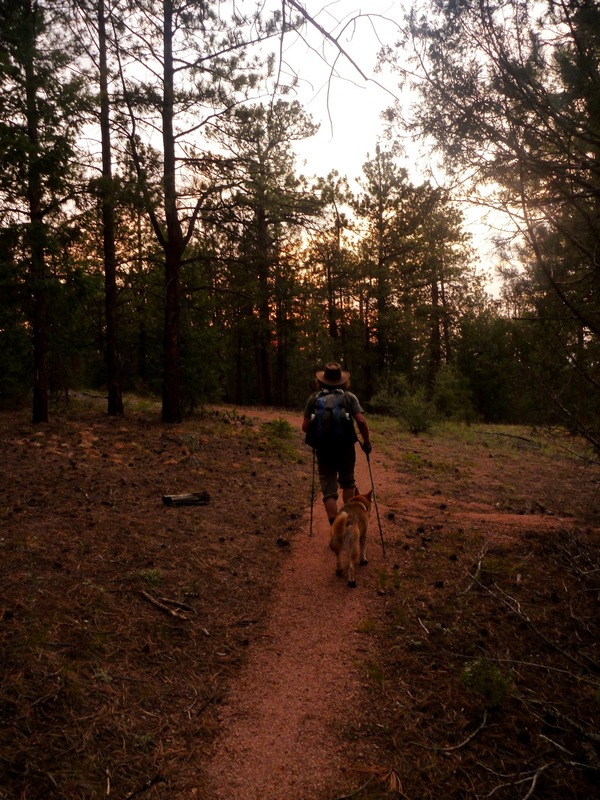 Onward through pine forests and buffed trails. These are quite popular with the mountain biking crowd and they were all very polite. 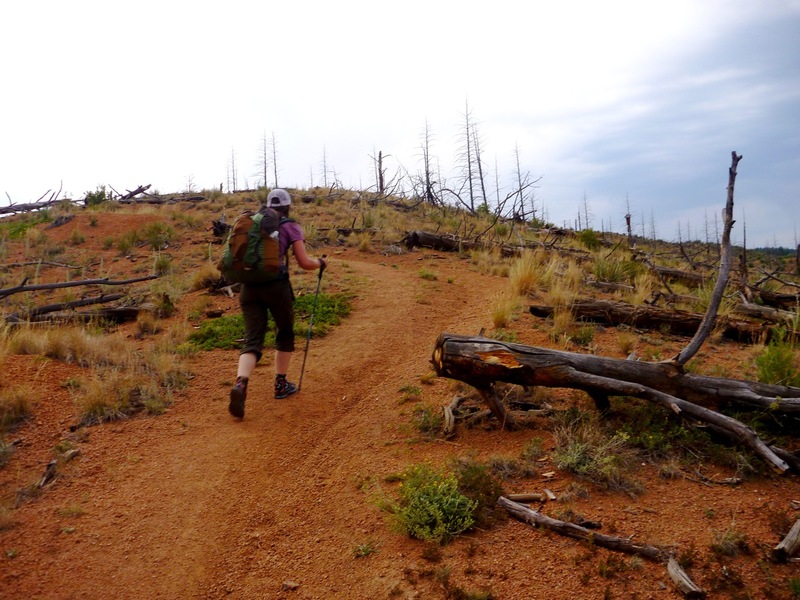 I can honstly say I'd rather hike than ride a lot of this terrain – it's easier on the body. Elaine's feet were problematic. We cut the first of many slits in the sides of them this afternoon. That seemed to help some but also pretty much determined she would need new shoes soon. Off and on thunderstorms all day – one particular clap was very close. It was nice though because it kept things cool. We ran into "Just Been" at a few waterstops. Once he questioned why we were filling up at a small creek when Buffalo Creek was close by. Good question. "Still working out our systems," was my reply. Onward and across to the creek. 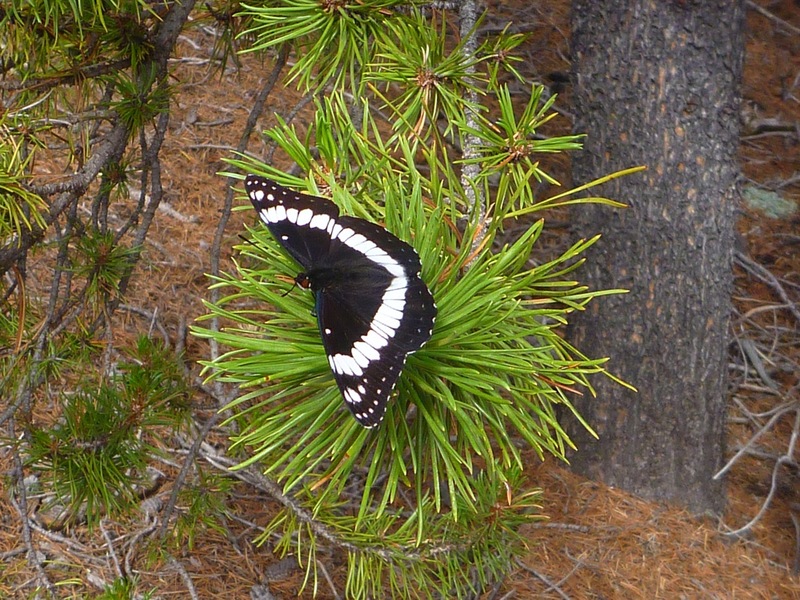 We made slow progress up a hill to a ridge filled with pines. 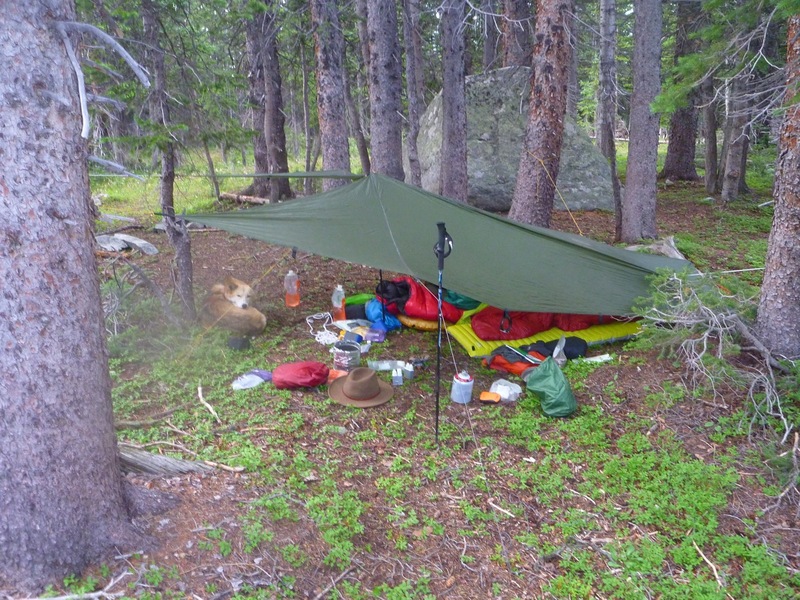 Elaine's feet really hurt so we stopped and set up the tarp. We took a nap and woke up feeling claustrophobic and down. After staying in this state for fifteen minutes or so, we decided to do something about it. 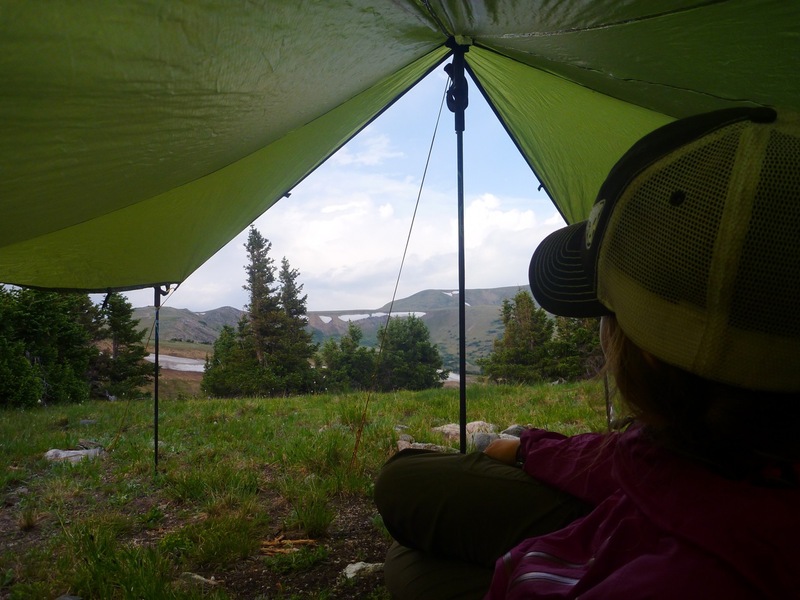 We set up the tarp in a way that it still provided protection but allowed Elaine to work on her feet. We cooked a good meal. 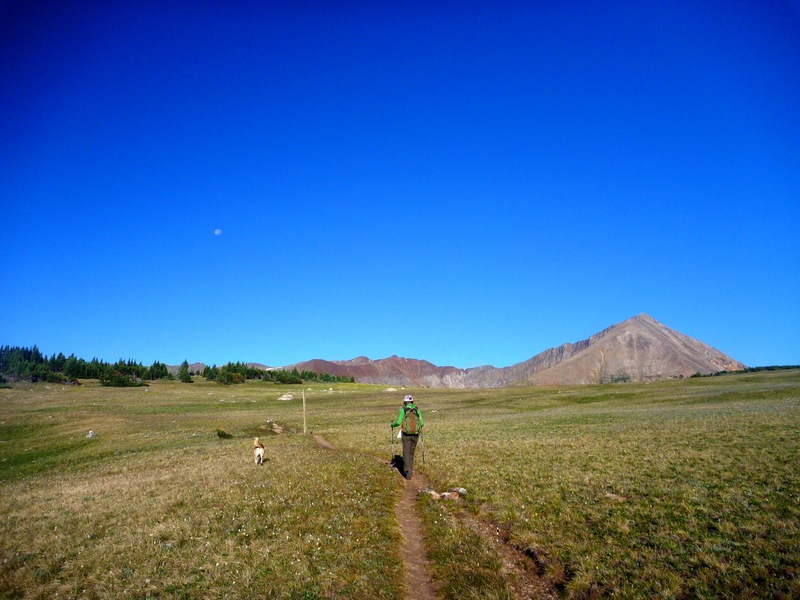 All in all, a better end to a tough day on the Colorado Trail. Happy Independence Day! Woke up in better spirits but Elaine's feet were still hurting. Enough of that. Almost immediately stopped and cut a massive slit into the side of the shoe. This helped a lot. As she said, it was either that or "duct tape bark to her feet." 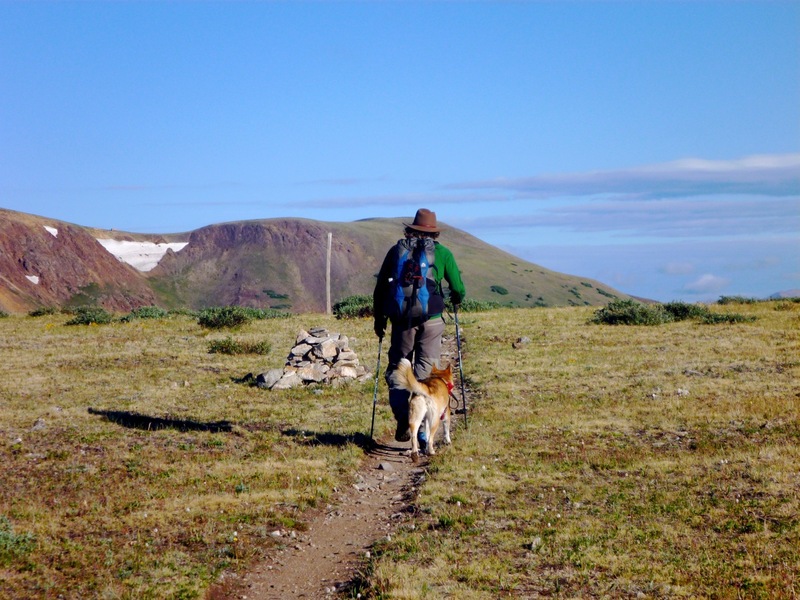 Onto the road to Bailey and the trail beyond – new terrain for me. Passed a few campers who said earnestly, "Good for you guys," when they asked us where we were going. We were immediately met with a big climb up a jeep road. There was lots of smoke in the air. 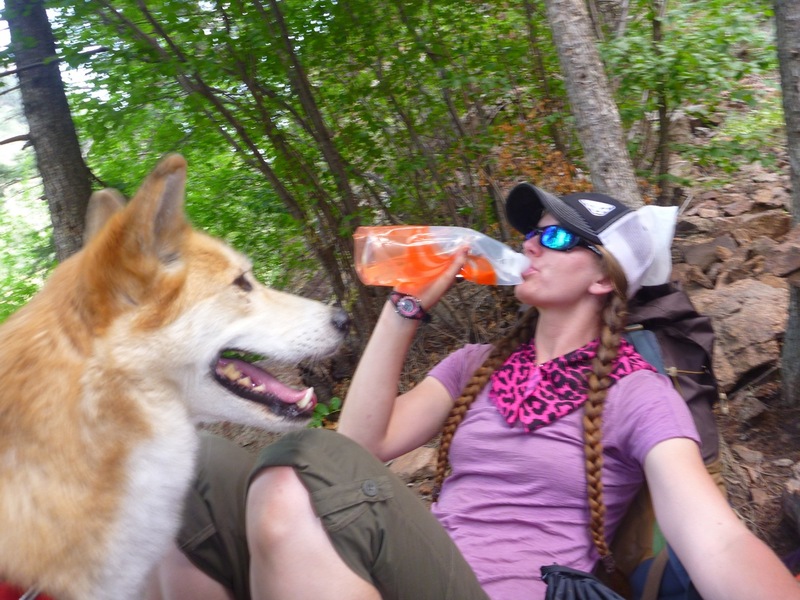 We climbed for awhile, filled bottles until meeting up with a beautiful new section of the Colorado Trail. We were both thrilled to get above 10,000 feet for the first time on the trip. It felt good to finally be entering big mountains and leave the eastern molehills behind. Elaine's feet were still very problematic, so we cut holes on the inside portion too. This helped somewhat. The beauty of the land helped off-set some of her pain. 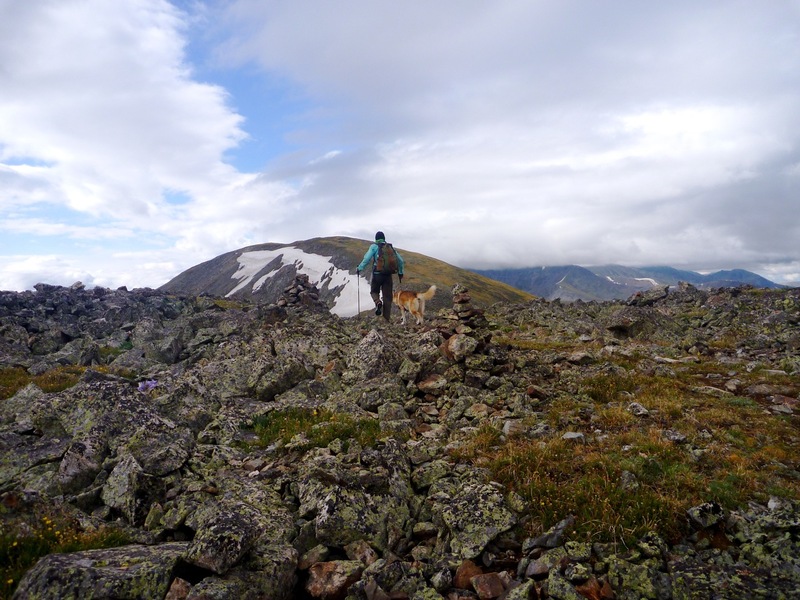 We entered into a spectacular valley that looked more like the Yukon than Colorado – the Lost Creek Wilderness. It's an amazing place. I imagine Elk and Wolves would love this landscape. There is a gorgeous creek running through it. 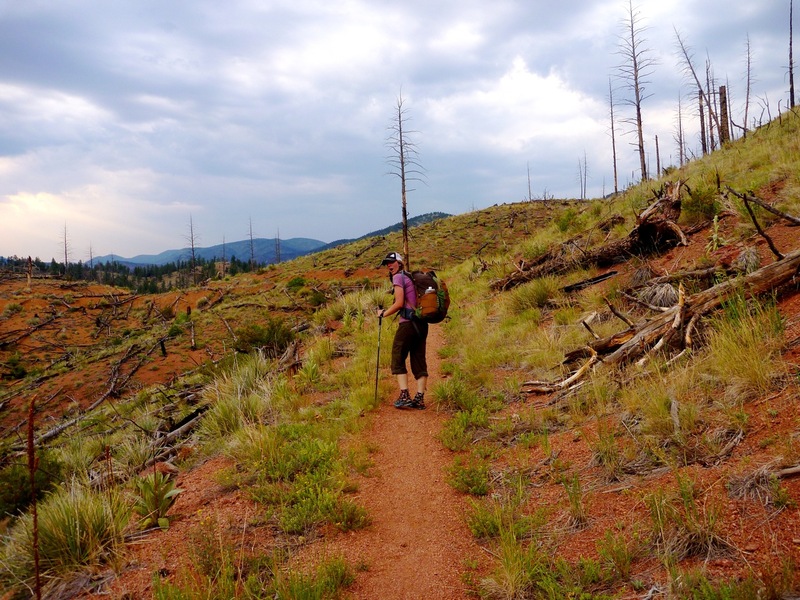 I'm glad it's a protected Wilderness – I had no idea it even existed. We truly do live in a beautiful and diverse state. There was a long, long gradual climb out of this valley. It was highly bizarre to be out on the 4th of July and not see anybody. Eventually we did cross paths with a couple with a dog and Alpacas. They were a bit surprised at the slowness of the Alpacas but seemed happy. Their goal was to make it to Marshall Pass. After hours we reached the top of the climb and began the descent. 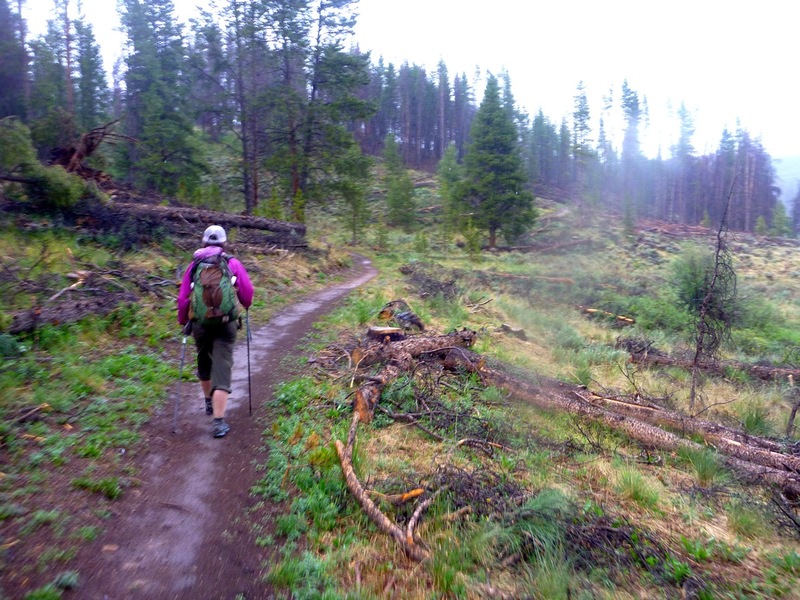 We were feeling good and spirits were high so we hiked on into another segment of the Lost Creek Wilderness. We camped around 6 pm just as "Just Been" passed by. 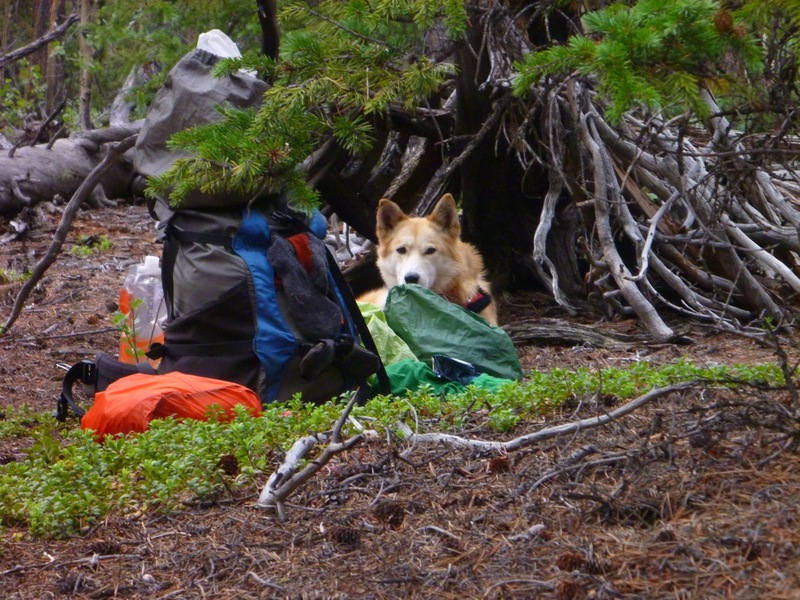 He looked out of breath and mentioned he was hiking late to get to his resupply in Jefferson. It was an OK evening. Elaine's feet were rightfully getting her down and we were alarmed to see that one of the blisters had turned red and looked like it may be getting infected. We drained it, applied Neosporin and hoped. 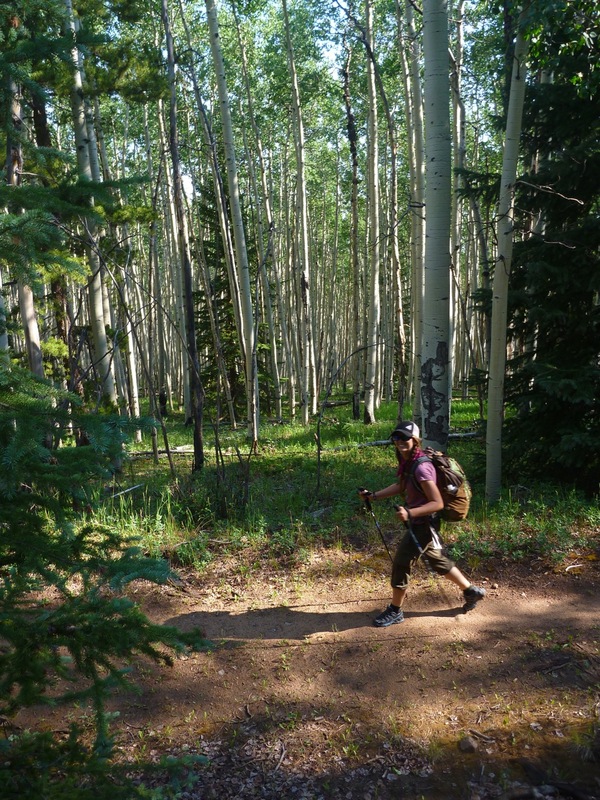 One thing is certain – the Colorado Trail brings highs and lows. Today was a day where we would at last get to the Continental Divide. It started rough with Elaine's feet. Part of the issue is me though. I take her pain personally, which leads to stress. 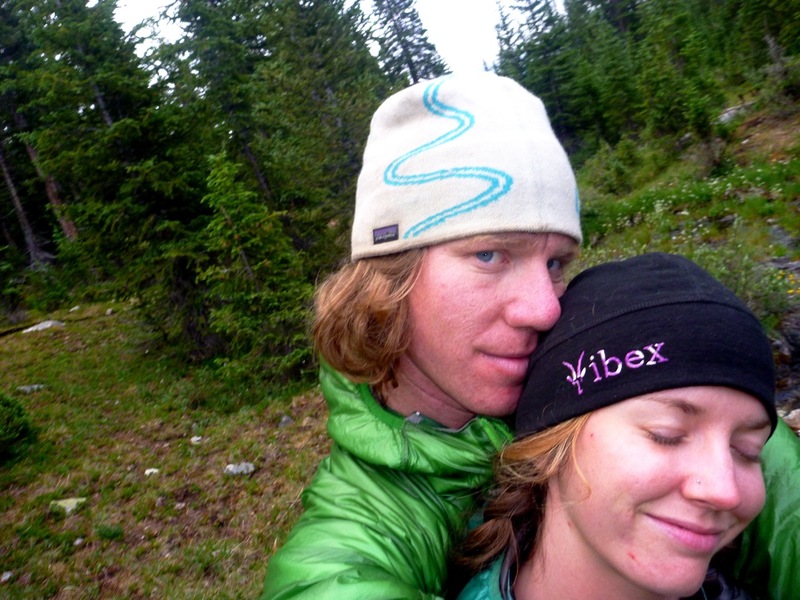 I need to work on that and just let her deal with pain…it's part of the deal when hiking 500 miles. We were passed early while still in camp by three old-timers who were clearly veterans of this game. I think we both made mental notes to not let that happen again. At the very start of the hike Elaine got dive-bombed by a hawk who was apparently protecting her young. Ha – if there is one thing I've learn it would be never mess with an angry mother! 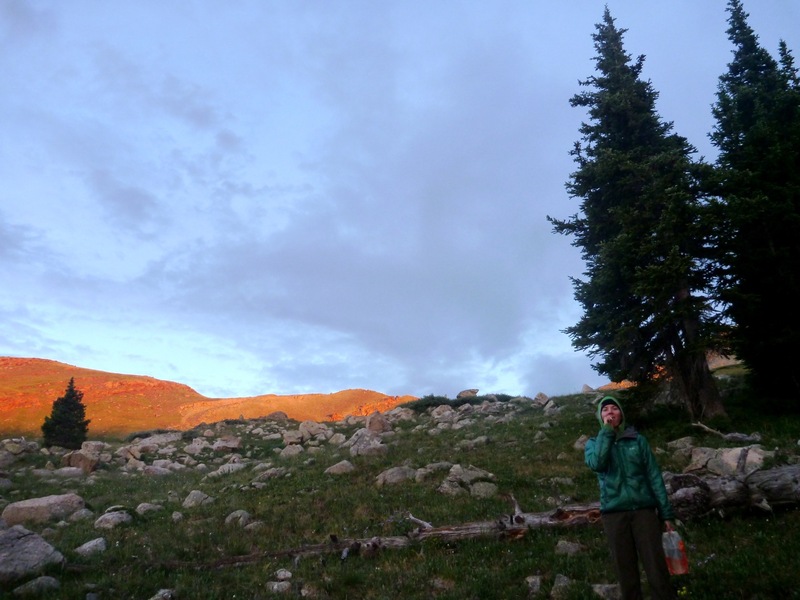 We descended to a creek where we filled up our water and then proceeded onto a long, open climb to Kenosha Pass. 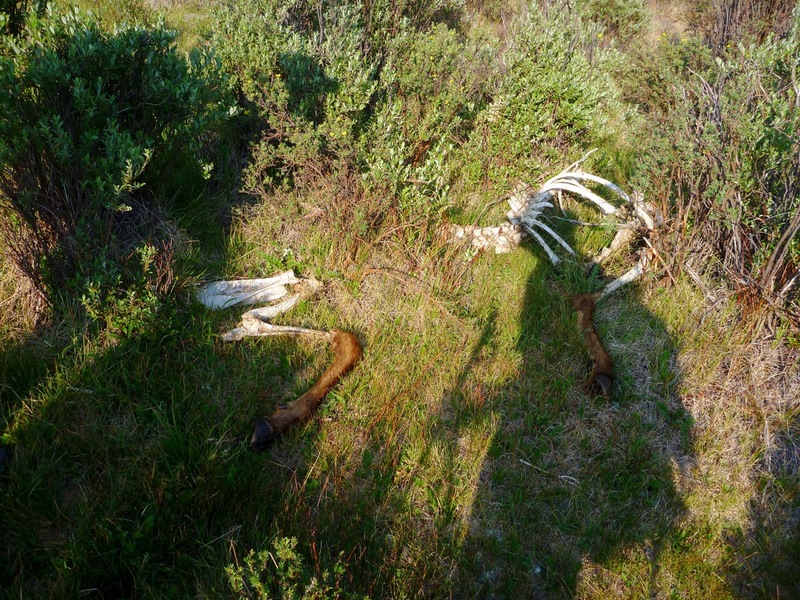 We passed one of the old timers who was also suffering from blisters. 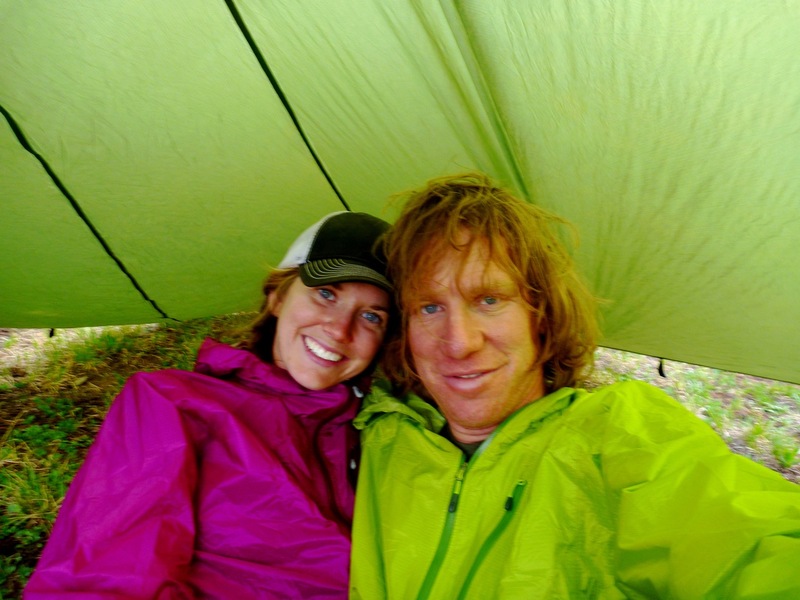 He told us he'd hiked th Appalachian Trail three times and had never gotten a blister. 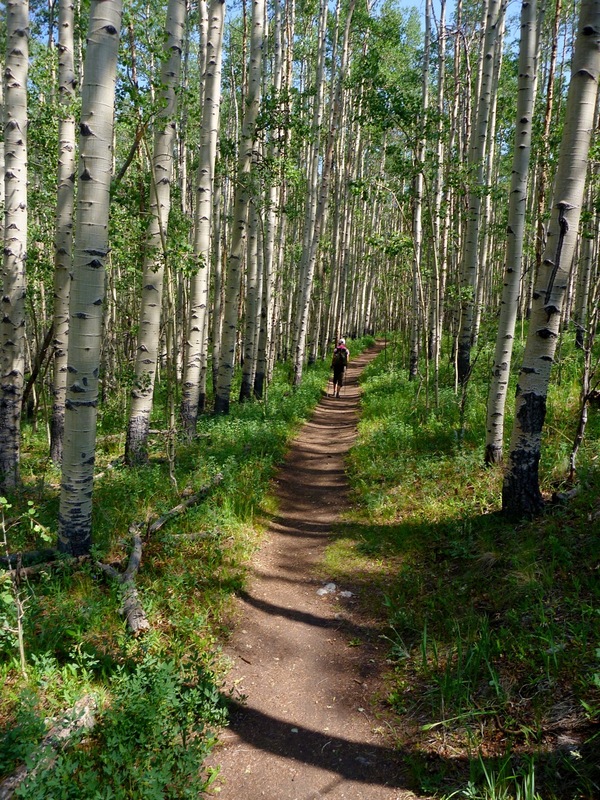 Hmmm…guess this Colorado Trail is no joke when a guy who has hike 6,000 miles is feeling the pain. 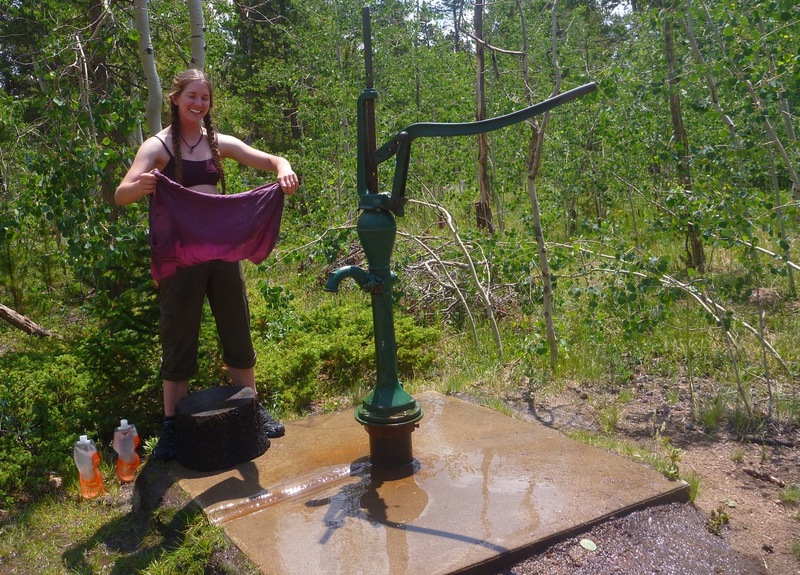 We enjoyed a snack in stupendous aspen grove and then met a real treat – the water pump at Kenosha Pass campground. We must have pumped 20 gallons or so out of that thing – filling water, bathing, soaking Stella. Note to ourselves – when we build our future home we'll be sure to include a water pump! They are worlds more fun than a simple faucet, and a better workout too. We were hydrated and feeling good, so we continued west. We entered some rolling hills that I had biked years ago. We ran into "Just Been" again – he seemed quite peeved that Stella was drinking water out of the same creek he was drinking from. What's she supposed to do…go on a water strike? 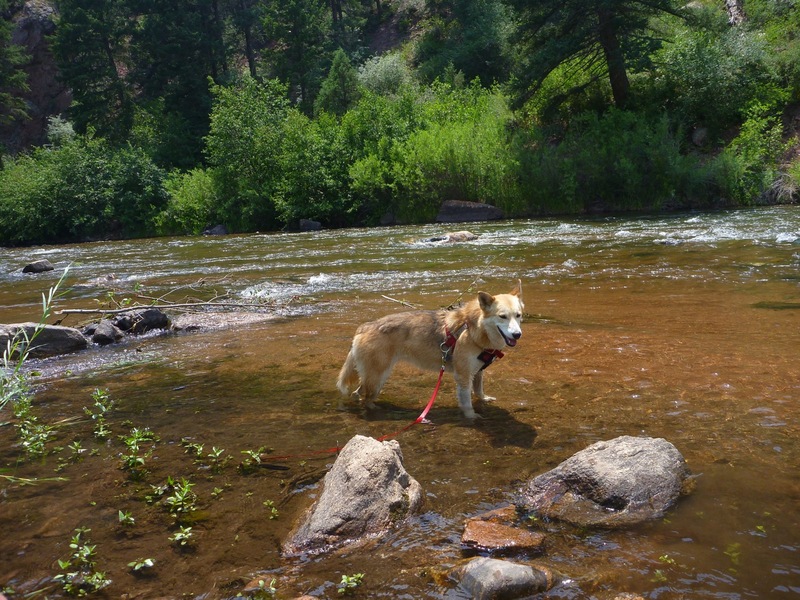 She's hiked exactly as many miles as we have, and unlike humans she doesn't wash her dishes in the creek. We also ran into another girl who told Elaine she was "dying of dryness." She was from the south and I guess our dry climate was wrecking havoc on her skin. 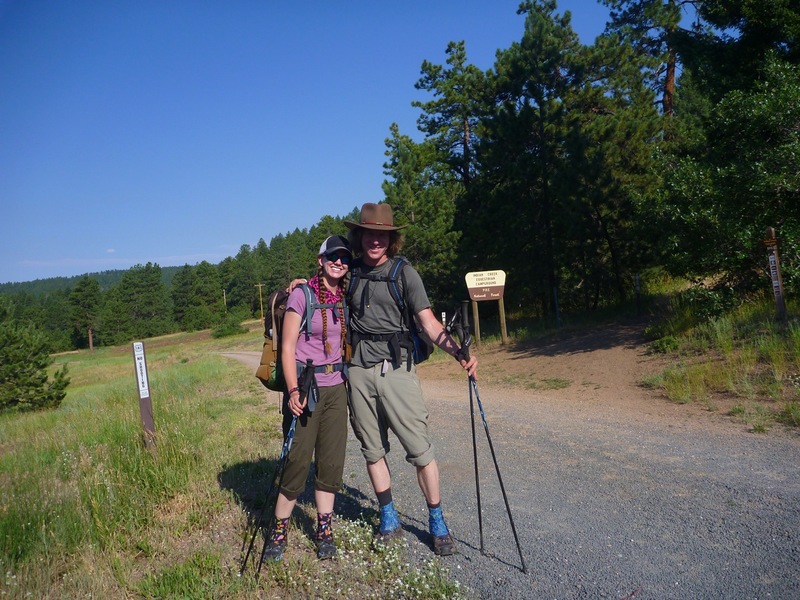 One thing we've both noted – there are an awful lot of southerners on this trail. Overall a good day and it was nice to be above timberline. As an old friend once said, "there are no bad days above timberline." It was a cold morning with a heavy mist and tons of condensation. We got cold last night, so we arose at 1 am to secure the tarp lower against the wind and mist. 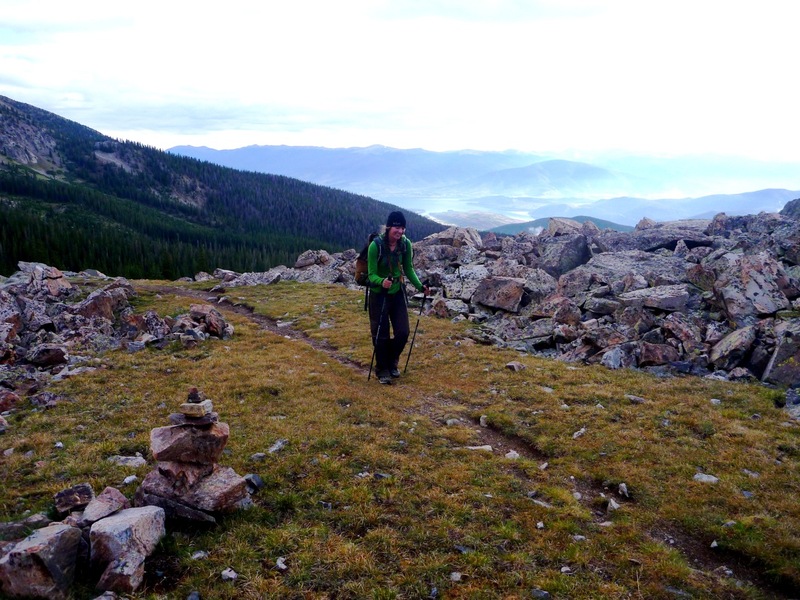 It was a gorgeous morning hike over the Continental Divide. Looking over to the mountains of Summit County was awe inspiring, and even more impressive was looking east to the rolling hills where we just came from. 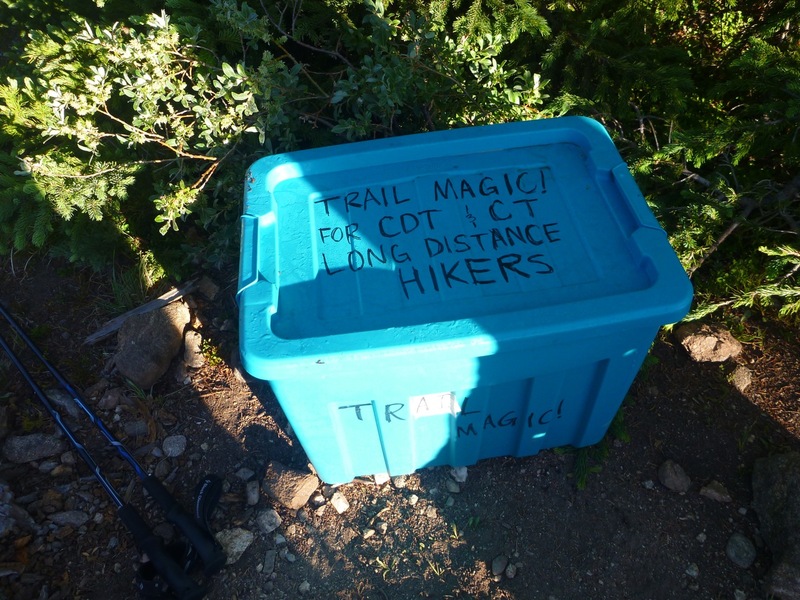 Up and over the divide, where we experienced our first trail magic – a cooler full of sodas intended for Colorado Trail and Continental Divide Trail hikers (the C.T. 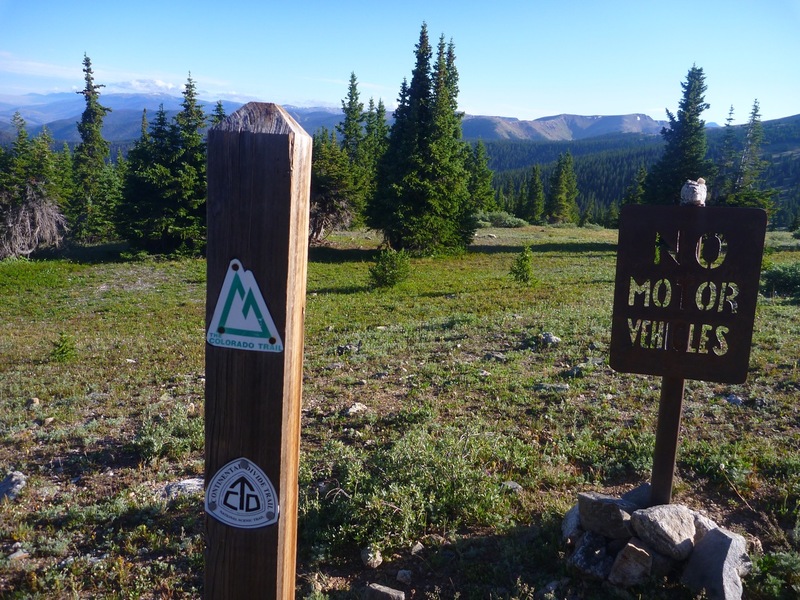 joins the Continental Divide Trail at Georgia Pass). Fantastic and uplifting. 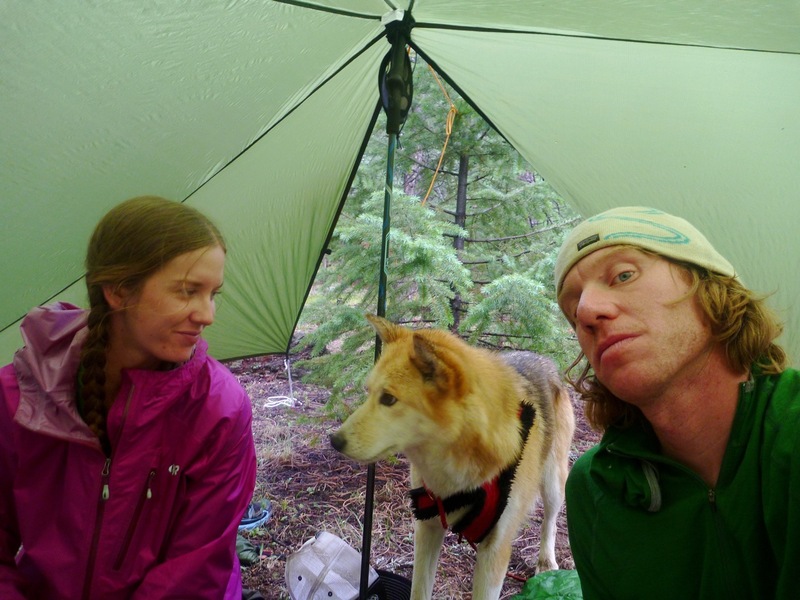 We took two Cokes and signed the book with trail names "The Wolf" and "The Lioness." It was a long, long hike down from Georgia Pass to Swan River and some of my old Montezuma's Revenge stomping grounds. 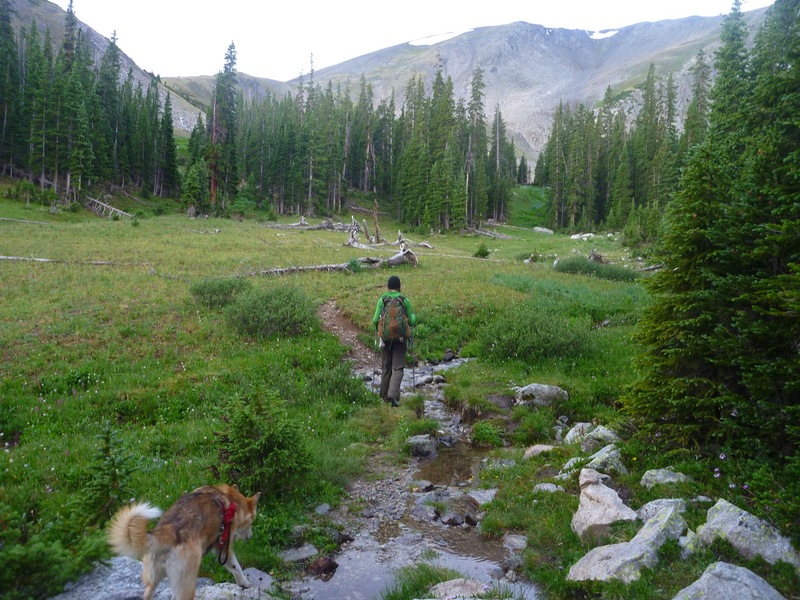 We passed through an area near the bottom of the pass that struck me as quintessential old Colorado – creeks, pines and mountains. The image of this place will hopefully stick with me for this lifetime. 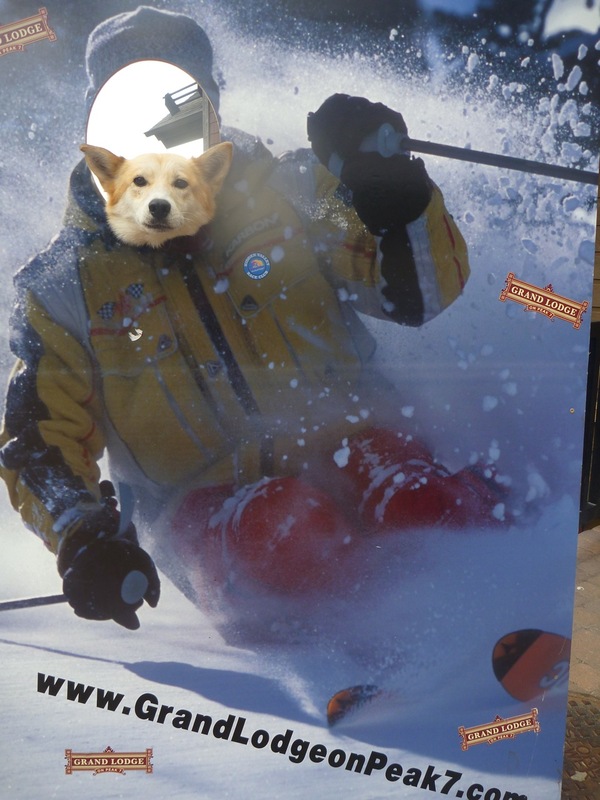 We passed a sled dog outfit, but Stella seemed thoroughly unimpressed. Been there, done that perhaps? We passed a campsite with blaring music while they all lounged around in pajamas. Nothing against pajamas, but why don't they just stay home if they need all that stuff? 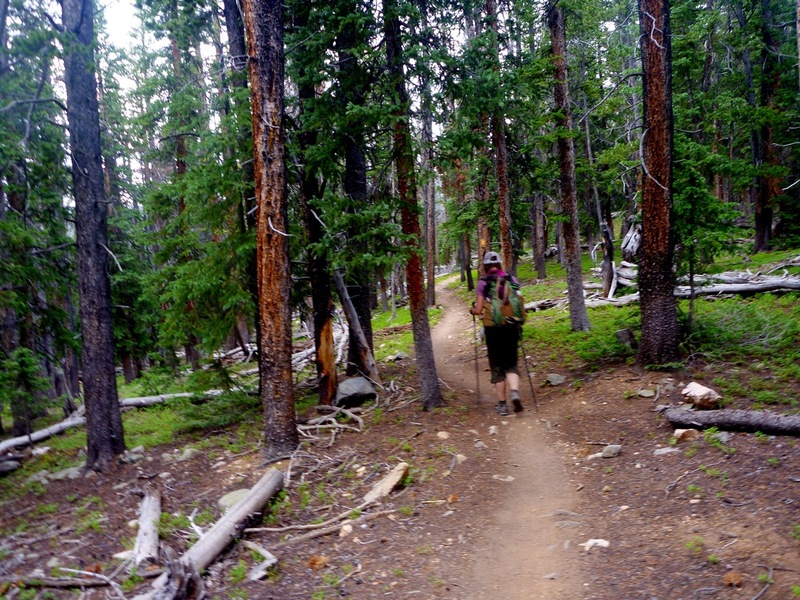 We headed onto a long climb and a section of trail frequented by a plethora of mountain bikers. We got passed by a guy and a girl riding mountain bikes at the bottom, but we caught them at the top – they seemed impressed. This was perhaps the most pleasant Summit County interaction that we had the entire trip. 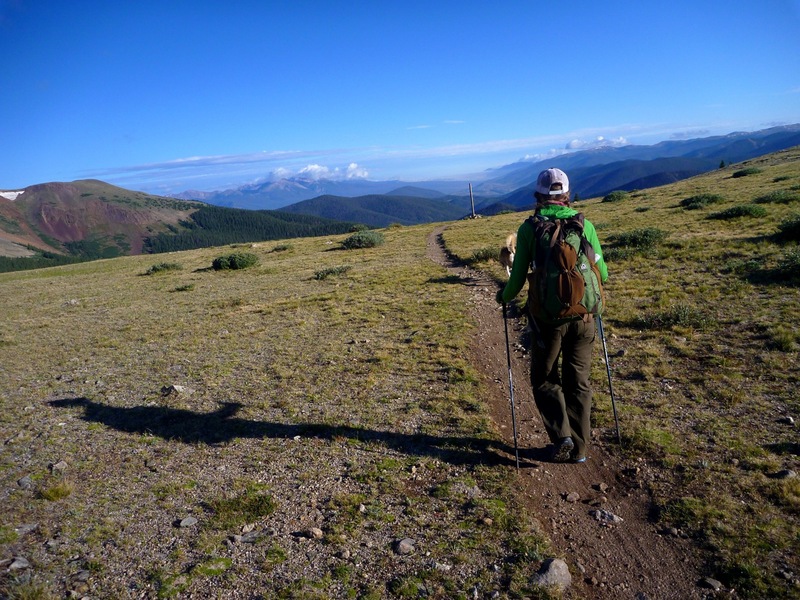 We ran into a bunch of riders – let's just say some were more polite than others We made a decision to hike quicker than normal so Elaine could head into Breckenridge and get a new pair of shoes before closing time. 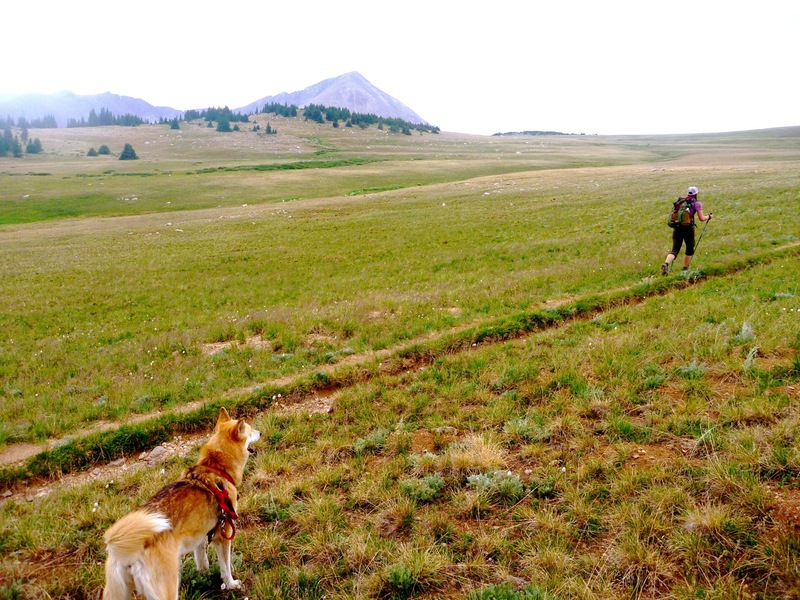 Near the bottom of the descent, we passed a nice guy thru-hiking with his dog. It was cool to see another dog out there. 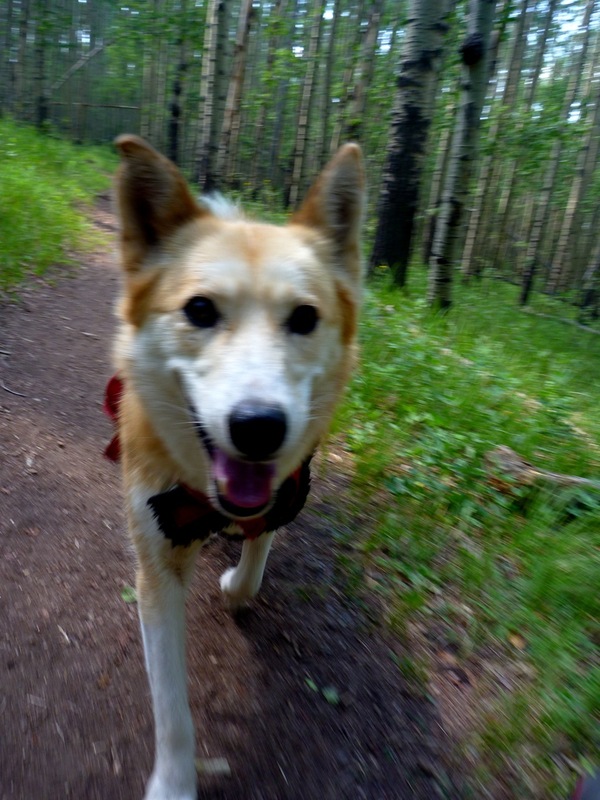 Most folks seem fairly incredulous that we would bring a dog along, but the truth is Stella's breed – the Alaskan Husky – is bred to do multi-day trips. Honestly, she'll probably be stronger than both of us. A huge thunderstorm rolled in and with it heavy, heavy rain. We both got fairly soaked, especially the pants, and I have to admit we were both a bit annoyed as it was so close to the resupply and we didn't want to get cold while we stood around taking care of that. The rain abated and we found our cache no problem. 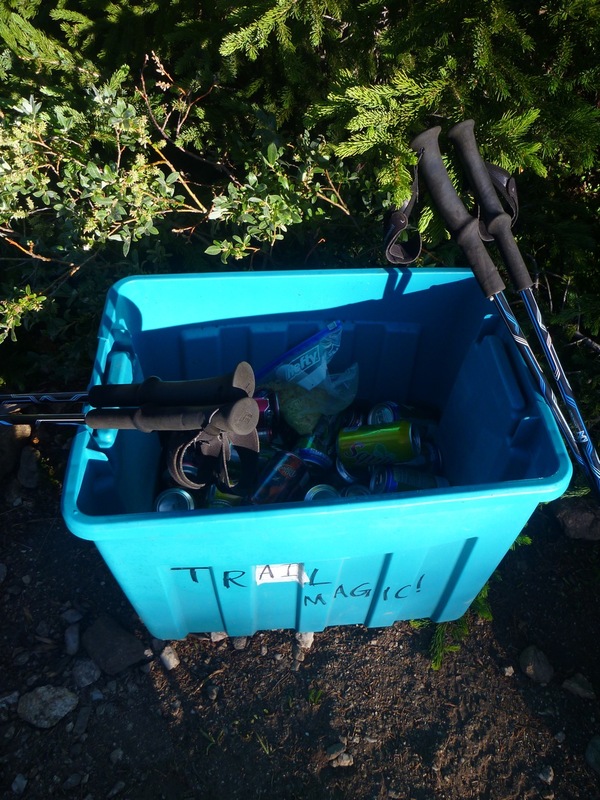 We loaded our garbage into the cache and stuffed our packs with new food. As we headed down to the road between Frisco and Breckenridge, the lightning started going nuts. Traffic was extreme. When the bus came we were greeted most rudely and told we could not enter because of Stella. It seemed a bit heartless as lightning was striking all around us with basically zero time between flash and boom. We elected to stay in the bus shelter for a moment to avoid death by lightning. We got bored with that so we started walking down the bike path to Breckenridge. Aware that time was of the essence, we decided to have Elaine catch the next bus to town while I would walk the extra four miles into town. We kissed goodbye as the bus came and then she was off in search of shoes. I felt a bit lonely on the walk, and wasn't thrilled with the long paved section with a million cars zipping by ten feet away to my left. 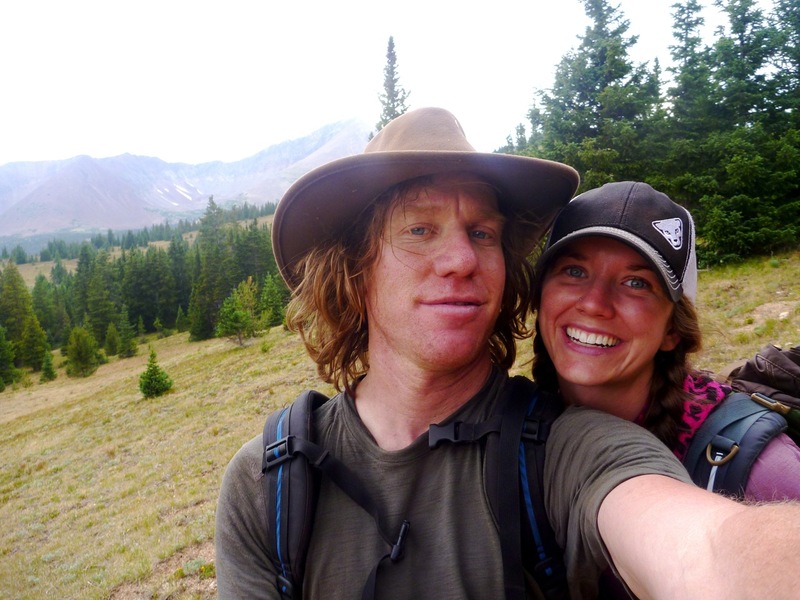 Upon arriving in Breckenridge, I ran into my former IMBA boss Jenn Dice – apparently there was some mountain biking festival in town. I failed to let her know that perhaps IMBA needs to up its education of cyclists, as most of the mountain bikers on the C.T. in Summit County were quite rude! It felt a bit odd walking through town with so many tourists, many of whom apparently thought Stella was a wolf. I did a brief search for a book to replace my Kindle but Breckenridge is evidently devoid of bookstores. I ran into Elaine and she had more luck than me – the folks at the Patagonia store sold her a pair of trail runners for 40% off and gave her a new pair of socks. Score! Meanwhile, the rain continued to pour and we were soaked to the bone. Darkness was coming. As such, we caved in and paid $190 for the "last room in town." We scarfed a pizza and failed to sleep much in the stale, still, stuffy room. According to the T.V., the monsoon season began today. All in all a mixed day that ended with a foray back into civilization. Day 5 campsite location was a condominium in Breckenridge. Apparently the famous reggae star Ziggy Marley was staying there too. Started this day of hiking with a bang – a wall straight up to the top of the 10-Mile Range. 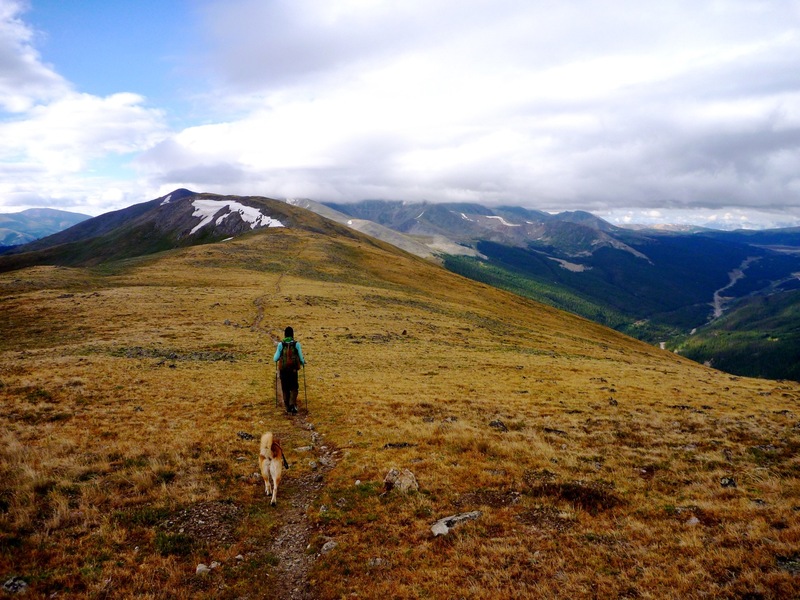 It's an amazing trail that tops out above timberline on a high alpine ridge. A horrid place to be in a lightning storm, but at 6 am it's delectable. Heading on the ridge north, Summit County drops away to the left. It was possible to look back and see our entire route from Georgia Pass, Lost Creek and beyond. I felt a real sense of pride having walked this far. To the west sprawled Copper Mountain and the snaking I-70, making its way up Vail Pass. On the way down we found a little snow patch. Stella showed little interest. A trail runner passed us going the other way. That's a hell of a great way to start the morning off in my book – a real life Nike commercial. Elaine's knee has deteriorated – there is a significant pain on the inside of the patella. It's frustrating because we want to do this trail in style. It's kind of shocking how far we've managed to come in a short time given a myriad of problems, and I have a feeling if we can catch a break we're going to fly. It's just a matter of breaking through and getting to that point. 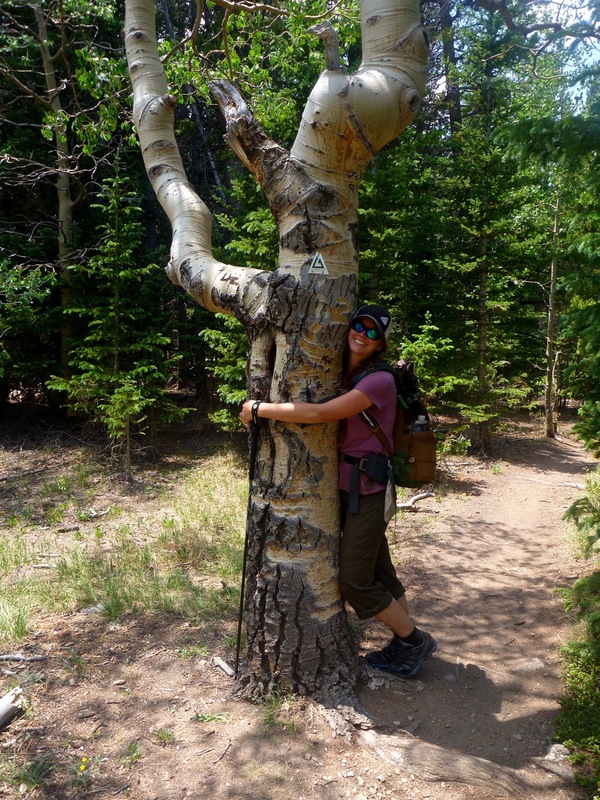 It's amazing how strong she is given the injuries…she's a powerhouse hiker and her determination is clear. She is a fighter. 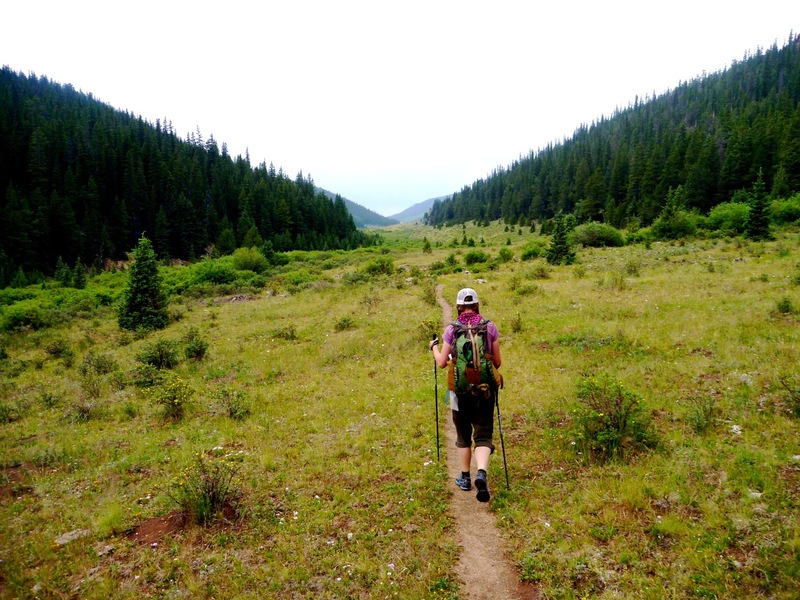 Hiking the Colorado Trail is not easy. If it was everybody would do it. Honestly the norm after hiking 100 miles in five days is to have some physical pain. Still, it can be hard to deal with. I'm actually quite shocked that my body feels as good as it does, but as I told Elaine, that could change with one single mis-step. One thing that is true…we want this badly. I think there is a certain truth to the feeling that we sometimes have an "us against the world" attitude. It's understandable given our history. It's absolutely tangible, and honestly I like it because I think it has the potential to drive us to some great things, but we also have to guard against it making us do something stupid – like hiking up a mountain in a lightning storm – because we want something so badly. 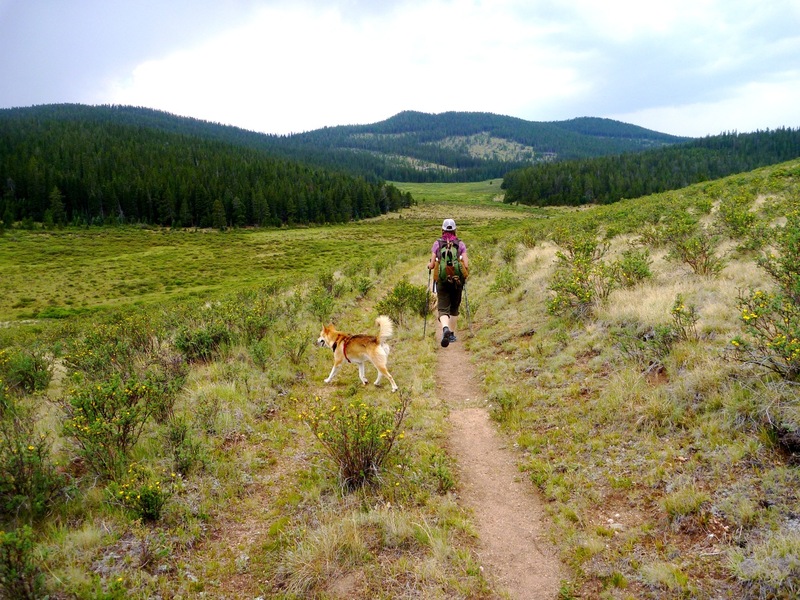 We eventually made it down the steep downhill to Copper – downhills are far-and-away the worst for her knee – and decided to divert off the trail slightly and grab a burger at a place in the resort called J.J.'s. 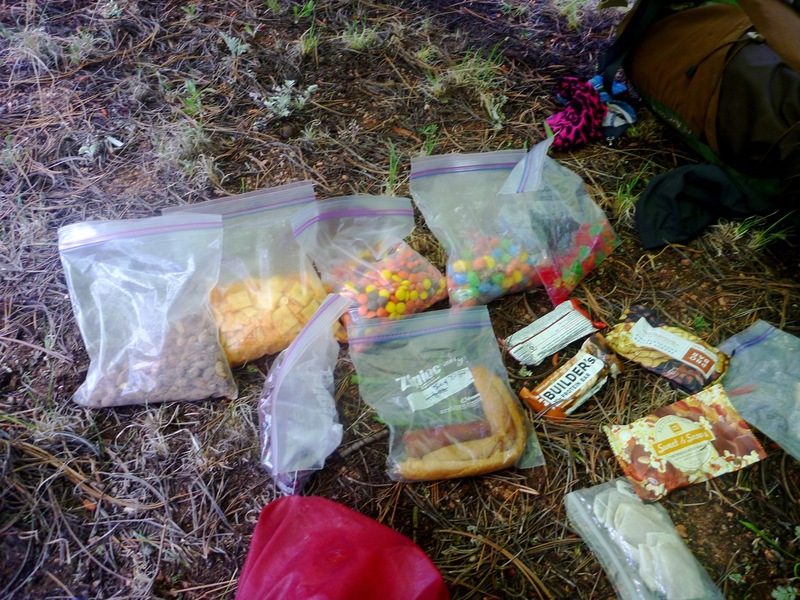 We had plenty of food in our packs but as Elaine said, "I'm never one to pass up a good burger." Here, here! A damn good burger it was. 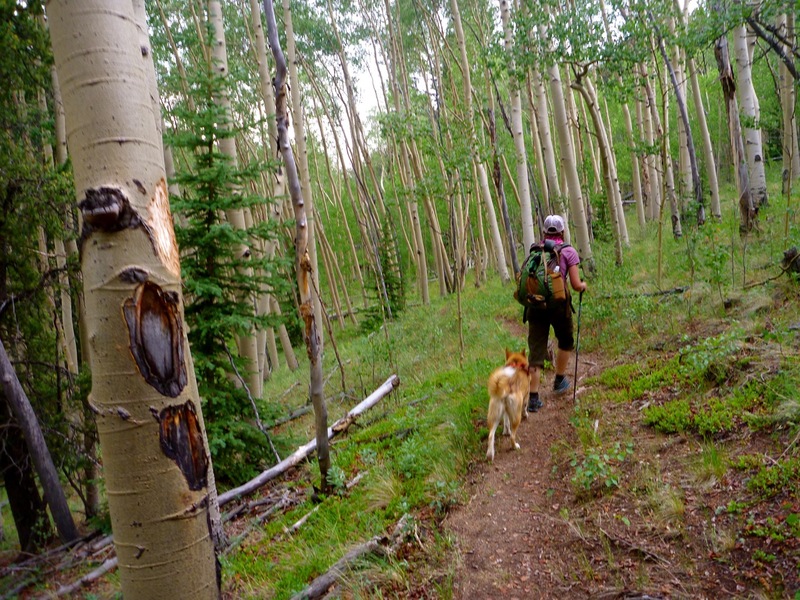 We headed straight up the ski slope back onto the Colorado Trail. 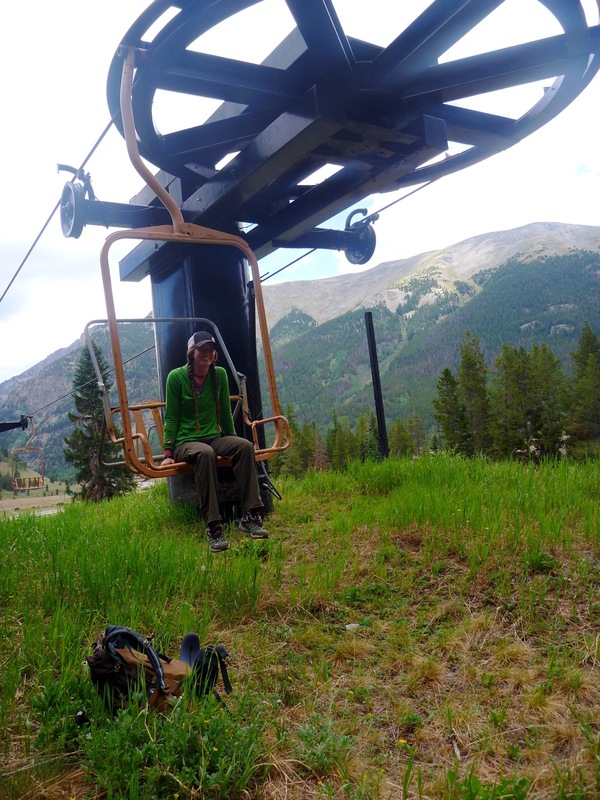 We passed a ski lift, so I had Elaine sit on a chairlift while I snapped a photo. 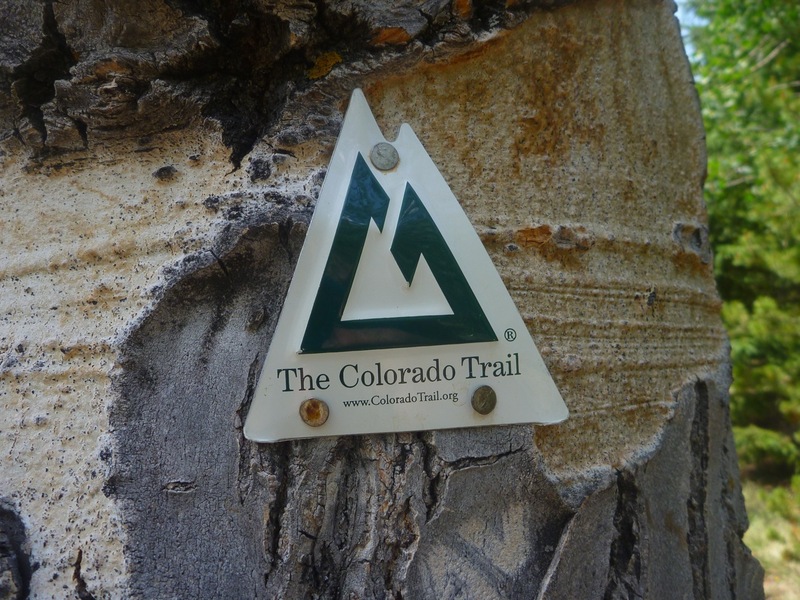 It seems like this trail does a nice job showing not only the beauty of our state, but also bits and pieces of Colorado history. 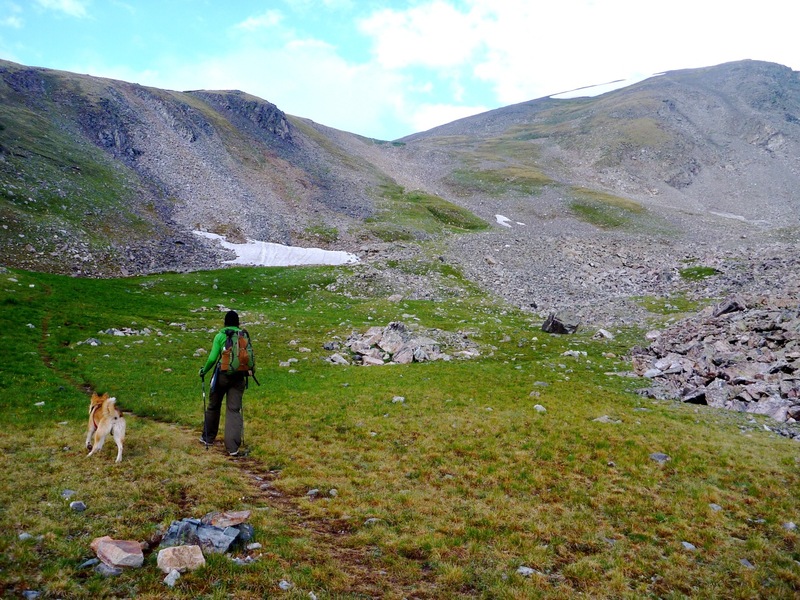 We finally circumnavigated all of Copper and entered a beautiful gully that paralled a mountain creek that eventually rose up to Searle Pass. We hiked quietly for some time. I think we were both kind of figuring out if we really still wanted this. A lot had been tossed our way and quite honestly Copper Mountain would have made a convenient quitting stop. And yet, we never stopped. We reached timberline, snacked, and gave the skies a look. Thunderstorms were moving in rapidly. Once we gained Searle Pass, a long, flat, above timberline plateau awaited us – less than an ideal place to be with electricity striking. 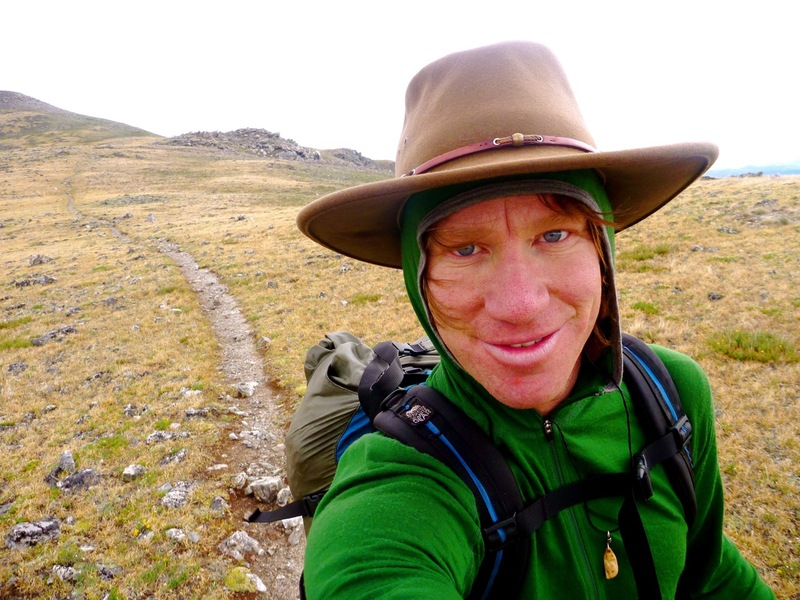 We headed past the 10th Mountain Division Hut Janet's Cabin and made it to Searle Pass. We got there and saw gnarly clouds. It didn't look promising, and despite being a bit behind schedule it wasn't worth dying for. 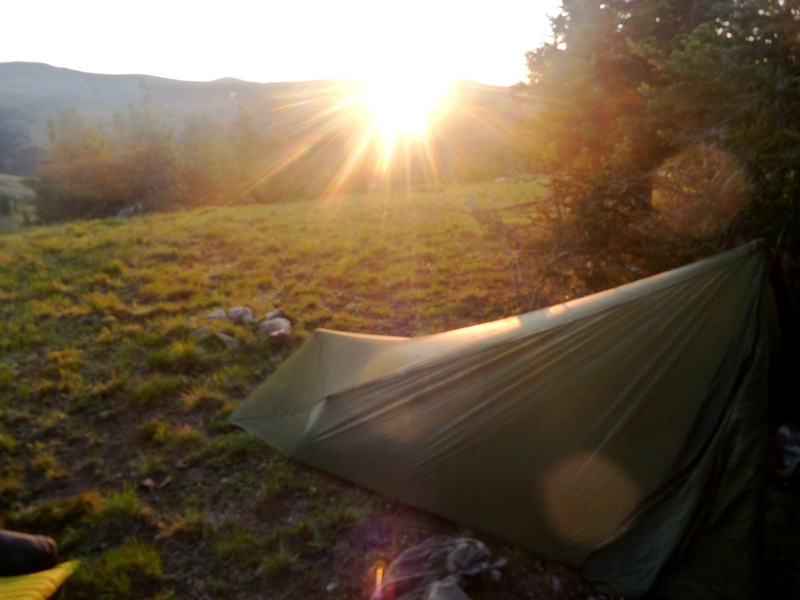 We turned around and set up a camp right at timberline. 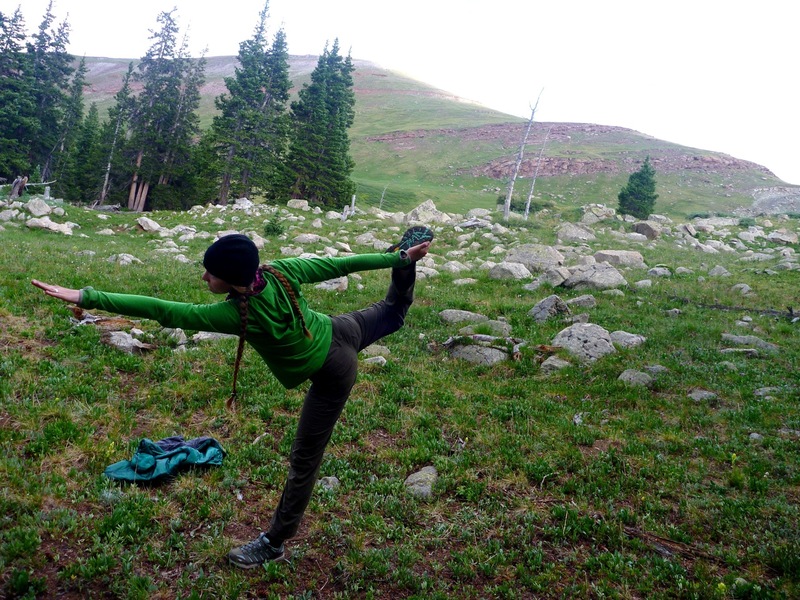 It was a good evening – we did some yoga, ate some good food and listened to the tundra birds. We tucked into our cozy sleeping bags. I think we may have crossed some sort of mental threshold today. Temptation to quit was there, but we didn't. The mental will power is there in droves, as is the physical fitness. Let's hope Elaine's knee follows suit.